the Newton's Nook Designs blog! This Biweekly Challenge was a Color challenge-Using red, green, white and black. Inky Paws Challenge #85 Winner! Jen W. creates a very large tree branch to support this naughty Newton hanging from an ornament! 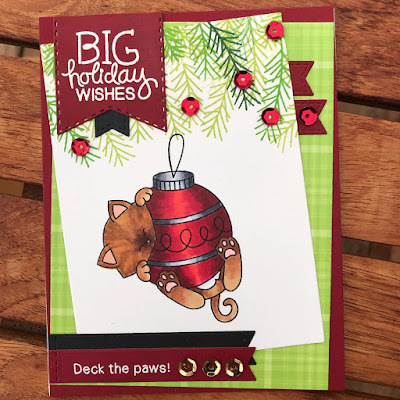 Jen uses the Ornamental Newton stamp set and die set and colors the ornament in the challenge colors. She then adds a black banner with the sentiment embossed in white! Such a playful and festive card! 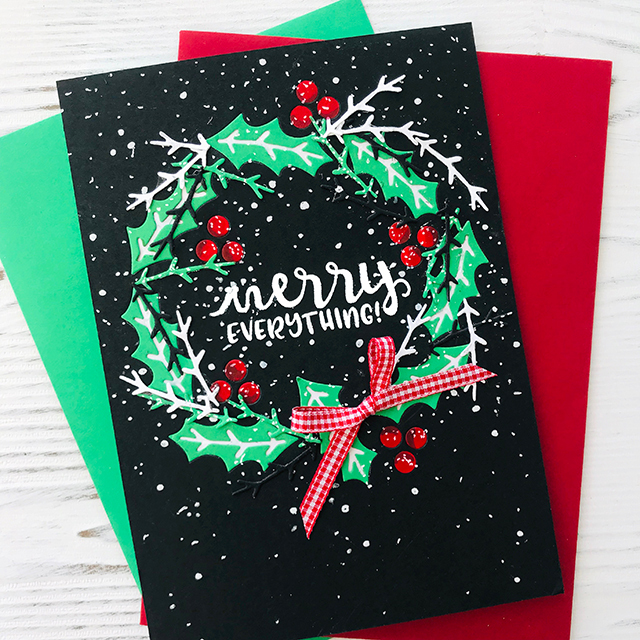 Bobbi creates this striking card by creating a wreath using the Pines & Holly die set and adhering it to a black snowy background. She then adds a sentiment from the Sentiments of the Season stamp set. She finishes this amazing card with a red gingham bow. Piccole Polpette creates this gorgeous vintage card by using distress inks and the Musical stencil for her background. 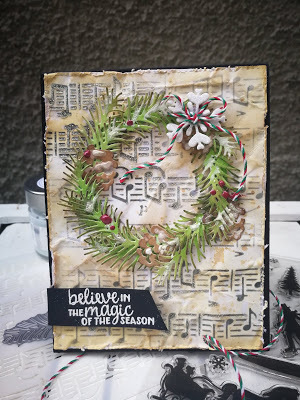 She then creates the beautiful wreath using the Pines & Holly die set. She embosses her the sentiment from Winter Memories stamp set in white on black. She adds a snowflake and twine to finish it off. Heidi creates this playful card by cutting her white background using the Frames & Flags die set. She then uses foils and the Holiday Foliage stencil for the shimmery base on which she adds the mug of hot chocolate from the Cup of Cocoa stamp set and the snowman from the Frozen Friends stamp set. She adds the sentiment on the banner. Such a delight! Marianne features Newton from the Ornamental Newton stamp set for her sweet card. She hangs him from those branches. She creates layers using the fun green plaid paper. She adds several banners including the one with the holiday sentiment. Super fun and festive!